Ten minutes from Lake George, walking distance to a golf course, and 30 minutes to Saratoga. The Six Flags-Great Escape Amusement Park just 10 minutes away. 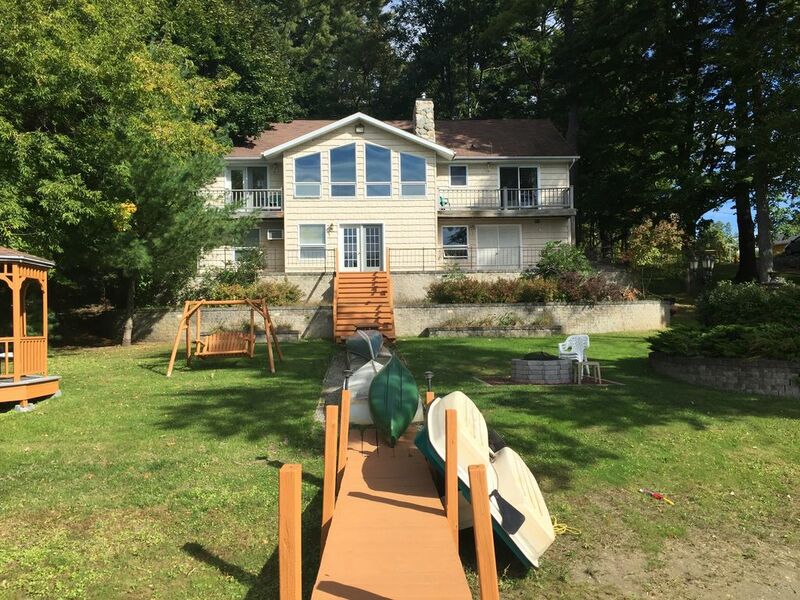 Eighty feet on Lake Sunnyside, a NO MOTOR-BOATS ALLOWED, 35 acre, spring fed lake with a canoe,rowboats,pedal boat, kayak ,private beach,dock and great fishing. 70 inch HDTV, SAUNA!! Enjoy the sunset from the lake-side gazebo and BBQ. So come and enjoy the peace and quiet yet be only minutes away from all the excitement you can handle! House was huge, our whole family, including grandchildren had a great time.Everything was close by (Bean's country store has the best pies) and we were so busy at the lake we never even went to Lake George. Our grandchildren (ages 3, 5, 6) actually "camped out" in a tent set up on the downstairs level. We had a great time. Had a wonderful vacation at this home that was BETTER than described! My wife,children and grandchildren want to know when we are going back. The house was clean,huge and on a large plot. The pool table and hot tub made even the one rainy day a delight. I high recommend this home for anyone and especially families. Thank you Dave, we hope to be back some day soon. We had 4 couples stay here NYE weekend and it was a great time. The house has all the amenities to relax and play. The lake is small and quiet. It was frozen over for ice skating and walking our dogs. The owner, Dave, is easy and great to work with throughout the booking process. I would imagine in the summertime this place is a gem. If you're looking to stay outside of the craziness off the village this is it.